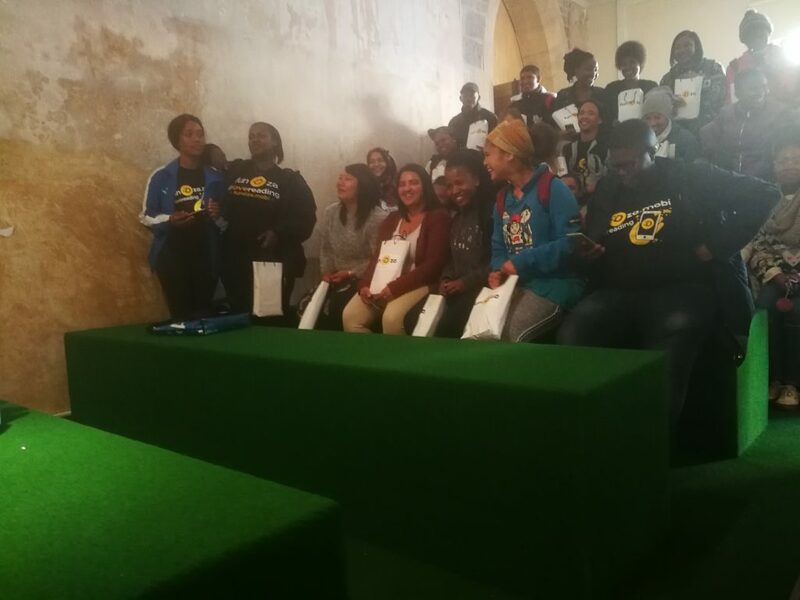 We once again had the honour of hosting 30 students and four lecturers from False Bay College Khayelitsha and Fish Hoek at this year’s Open Book Festival (OBF) on Friday 7 September 2018. Very big thanks to festival organisers Mervyn Sloman and Frankie Murrey of OBF who provided us with complimentary tickets for the groups. For the first session we were split up and students could choose between Turning Point or Urbanity, Blackness & Mobilities. In Turning Point, Haji Mohamed Dawjee, Ming-Cheau Lin and Iman Rappetti spoke to Sara-Jayne King about defining moments on their journeys. One of the students who attended this session said that she could relate when the authors spoke about being censored. The student comes from a conservative family where certain topics with her parents are taboo. She was surprised to learn that this happens with others and found it liberating to learn. We re-joined after the first session and students shared what they learnt with each other over our goodie bag lunches. This was followed by the second session Too Close for Comfort. This was the perfect session for our students as there was a little bit of something for everyone and the diverse authors were wonderfully chaired by Palesa Morudu, of Cover2Cover Books. Joanne Jowell author of Winging It shared with us the biography of Jonathan Kaplan’s quest of becoming a solo father. And the dynamic to-the-point investigative journalist Mandy Wiener took us into the heart of organised crime with titbits from her latest book Ministry of Crime: An Underworld Explored where the lines between gangsters and powerful political figures seem murky. 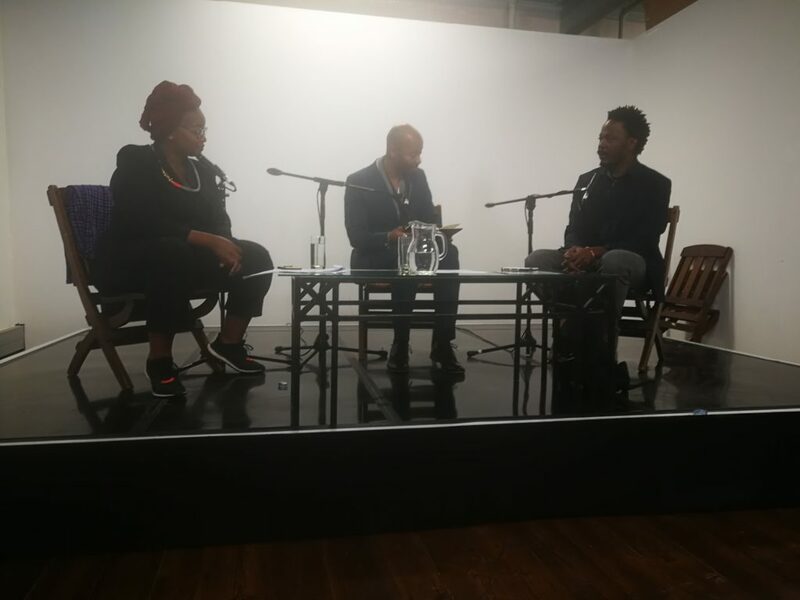 And finally on this panel was the man who stole our hearts and ignited our imaginations: Mphuthumi Ntabeni. His latest book, The Broken River Tent is set in the time of Maqoma, the Xhosa chief at the forefront of fighting British colonialism in the Eastern Cape in the 19th century. It may be called a novel but this is a work of fiction-meets-history. And a book that has been 20 years in the making. He generously spent time answering some of the students questions afterwards. 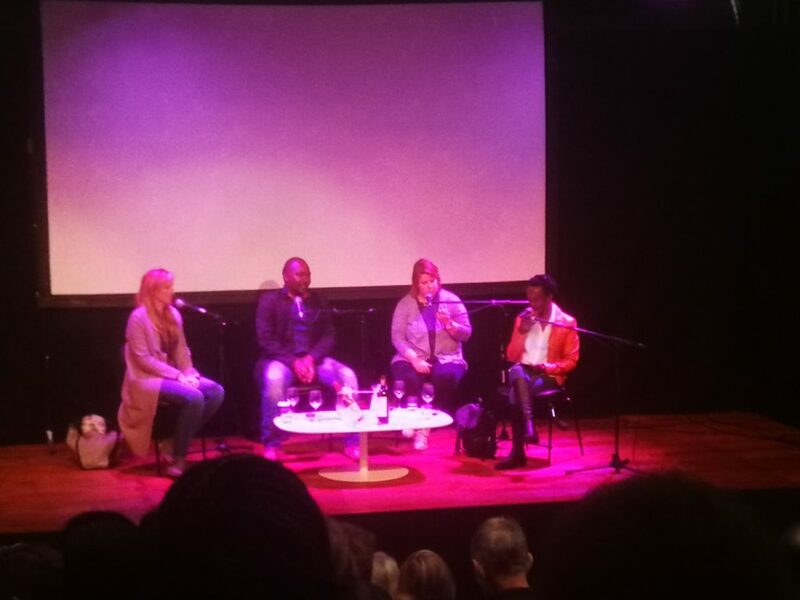 We would like to thank Open Book Festival for the quality of their panels and for the complimentary tickets. Our students loved it! Thanks too goes to the HCI Foundation which sponsors the special reading for enjoyment campaign project that FunDza has been running with the students at the two False Bay College campuses. “Thank you so much for Friday! Once again it was such an amazing time and the students thoroughly enjoyed themselves. The speakers were thought-provoking and motivating.” ~ Sean Butler, Fish Hoek Campus lecturer.